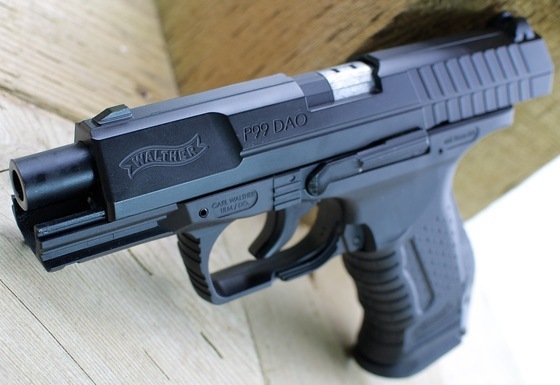 The Umarex Walther P99 CO2 Blowback Airsoft Pistol is a fairly low cost Airsoft BB pistol but even so, there is no reason why we should expect less than stellar performance from it. I have already done a pretest for the Umarex Walther P99 CO2 Blowback Airsoft Pistol while making my Table Top Review and it shot right around the 333 fps mark, but it was a colder day then. I also shot my Umarex Walther P99 DAO from a much closer 20 foot distance for the pretest and got a respectable 2 inch grouping. On the actual Field Test Shooting day it was much warmer (tank top weather ;) and so as would be expected, this time my Umarex Walther Airsoft P99 shot a bit quicker at right around a 356 fps average, shooting 10 rounds through my Chronograph. I would expect to get even more fps on an even hotter day as it was only about 22 degrees Celsius or about 72 Fahrenheit on this test day. Accuracy from 30 feet out was pretty close to my pretest 20 foot testing if you exclude the two flyers but again the Umarex Airsoft P99 version was shooting a bit to the left which unfortunately can not be adjusted other than changing my sight position on the target. I would think the trend to the left will only increase as we shoot further out but this gun is really best suited for close quarters shooting anyways and should have no problems right up to 50 feet shooting a man sized target..